Heyyya!!! Do you believe in fairy tales? 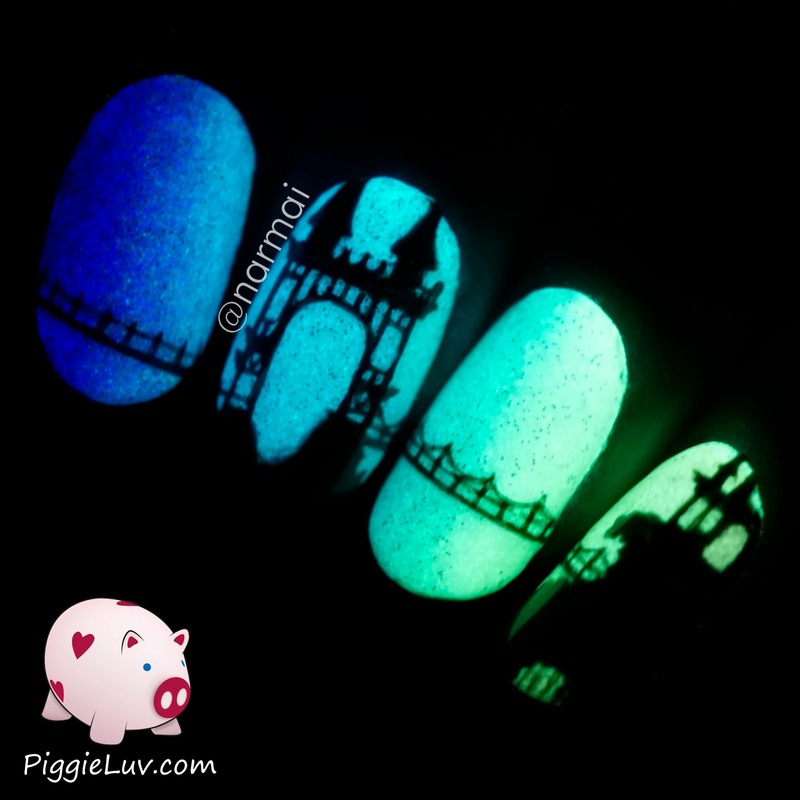 Whether you do or don't, you have to admit there's something magical about a glow in the dark castle... 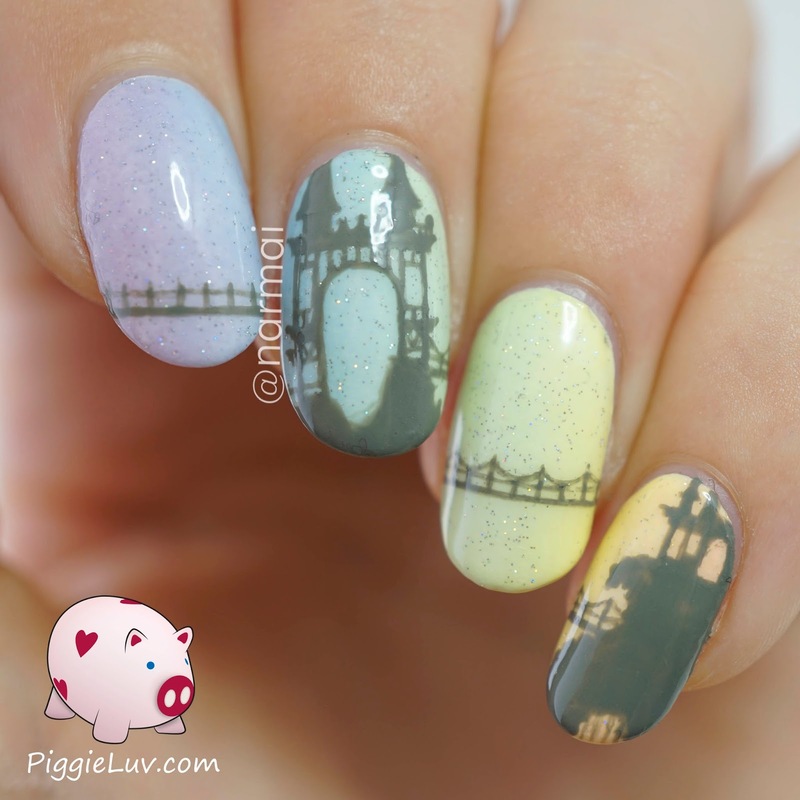 I'm calling it my pastel castle (it rhymes... sort of) and it's all made using Serum No. 5 polishes and acrylic paint! Click to see more pictures, and my video tutorial! It's all freehanded using dark grey acrylic paint and my Basic One Gold detail brush from Christrio Scotland. I'm not too impressed with some of the details but I enjoyed working on it, it was my ocean of peace in a very busy and stressful time without much nail art. The pictures aren't great because I'm still fighting with my light box, and the daylight here has let me down lately. So please focus on the artwork, and not on how dead my fingers look! Thank you! I LOVE the glow of this gradient! What you're seeing is the beautiful radiance of Serum No. 5 Laven-Daringly Bright, Blue Blazes, Glowin' Of Eden, Day Glow and Atomic Peach. 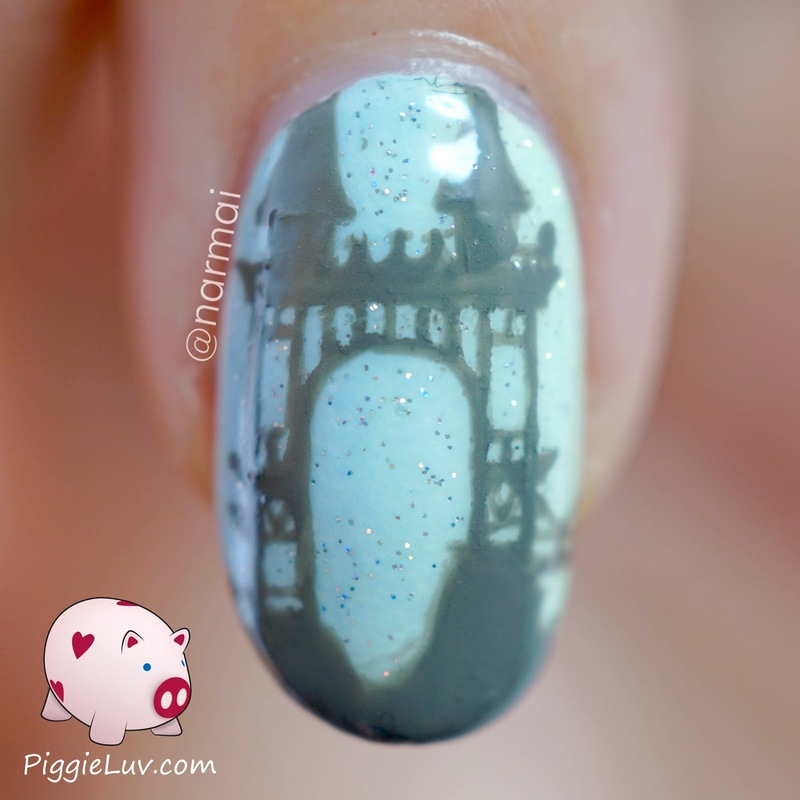 I put some China Glaze Fairy Dust on top of it but I forgot to include it in my video tutorial... oh well! This picture is completely unedited (except for the cropping, rotating and watermarks) and this is just how my camera picked it up! The Serum No. 5 pastels are already really bright, and I think they got an extra boost from the white polish underneath the gradient. Gorgeous! For this nail art, start off with a white base color. Tape off your cuticles to minimize cleanup afterwards, I use scotch tape and medical tape (it's nice and pliable). Time for the gradient! Paint stripes of your chosen colors on the sponge, making them overlap a bit, and gently roll the sponge over your nail to make the gradient. This might take some practice to get a smooth result! When you've achieved a nice look, remove the tape and put top coat on your gradient nails. Don't forget to clean up around the edges. Now for the good part! 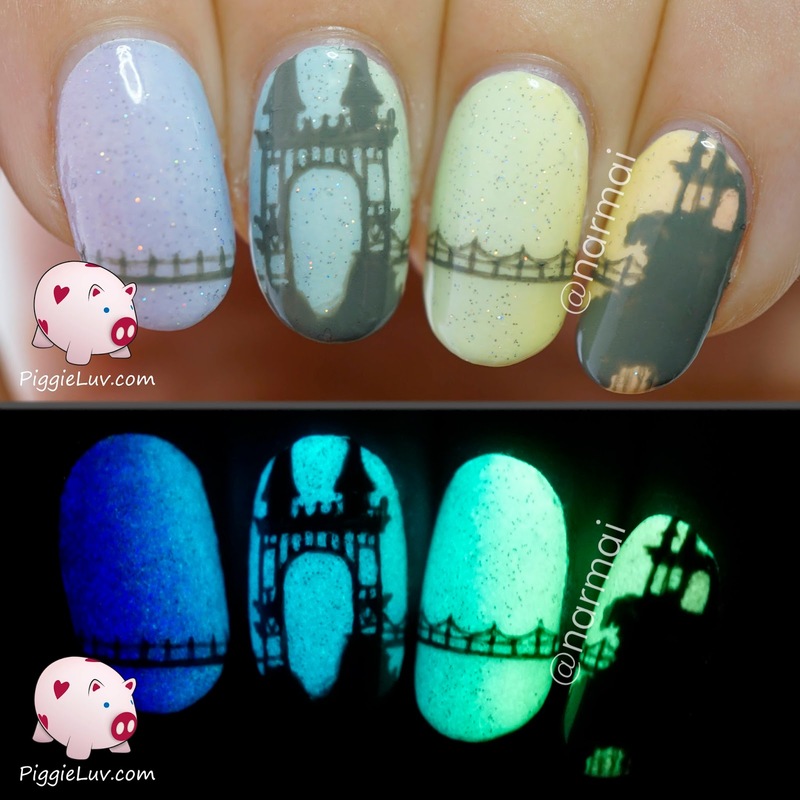 Paint your castle and add bridges, prison bars, dragons, butterflies, knights, or whatever floats your boat. Top coat and you're done! I received Serum No. 5 Day Glow & Atomic Peach as a press sample for an honest review. Opinions expressed are 100% my own and not influenced in any way other than the quality of the product itself.